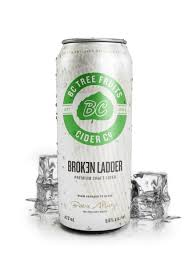 NEW BC Tree Fruits Cider Co.
As you likely know, BC Tree Fruits Cooperative, is a 500+ co-operative of fruit growing families based in the Okanagan Valley and responsible for much of the local apples, cherries, nectarines and pears found in the produce aisle across Canada. After nearly 80 years of rich history in fruit production, BC Tree Fruits is entering a new category with the launch of BC Tree Fruits Cider Co. This new venture has been years in the works, and included a labour intensive recipe process, many taste tests and the build out of the in-house processing and bottling plant in Kelowna, BC. The result is BCTF Cider Co’s first cider offering titled Broken Ladder. It’s made of a secret blend of 6 different local apple varieties all picked from their Okanagan orchards. Nothing else. The results is a balanced, golden coloured cider with no added sugar or additives. BCTF Cider Co. is on BC Liquor store shelves, as well in select private Cold Beer stores and restaurants/pubs.